Are you just looking for a light, added layer for comfort on the job? 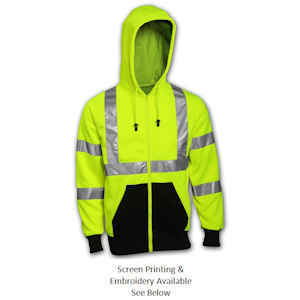 The Class 3 High Visibility Hooded Sweatshirt from Tingley may be the right choice for you. It’s a simple, but comfortable choice, and available in a fluorescent yellow-green, and orange. 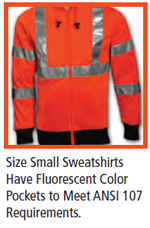 The 2” silver reflecting tape that comes with these high visibility sweatshirts mean that they are highly visible both during the day and the night time. These shirts comply with the highest visibility standards, making them a safer choice for reducing work place accidents. These sweatshirts are made with a durable, comfortable polyester material that make them an ideal choice for protecting you from a chill when you are outside working all day at the job site. The black that comes on the front of these sweatshirts also conceals dirt, making them an ideal choice for the most rugged of workdays. You’ll still be able to carry your tool and other necessities for the day, and keep your hands warm in the pouch pocket. These high visibility sweatshirts range in sizes all the way from small to 5x, so there’s sure to be a size that fits you. These hooded sweatshirts offer a convenient way to increase your visibility and improve your safety on the job, so you will want one today. They’ll make safety a little more convenient. High visibility sweatshirts are constructed of a comfortable high density polyester material. Tingley’s Job Sight products make ANSI 107 compliance for high visibility apparel easy.